I wanted to make a brief note on a product you’ve probably seen advertised on social media. Black History Flash Cards: Vol 1 from Urban Intellectuals. I received my pack a few weeks ago. I must say I’m impressed with the whole operation. The cards and outer pack are well designed with sturdy materials. The selection of people and events is well thought out, and they delivered in about 4 days. Hard to beat! Extremely important to me is that the creators have included figures and events beyond the United States, including figures from antiquity. Events such as the Haitian Revolution and Montgomery Bus Boycott, and activists such at Huey P. Newton and Nat Turner are necessary to give a complete picture of Black history. This is truly a Pan Africanist’s card deck. 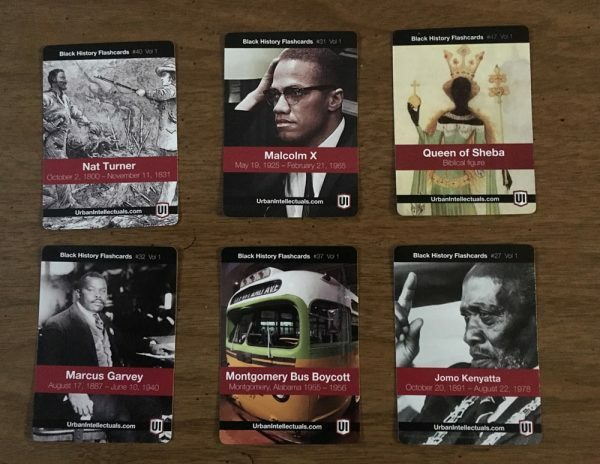 I can’t help but compare it to the previous one I’d been using, African American History Knowledge Cards by Pomegranate. None of the figures shown here are included in that deck. The Pomegranate cards have been around since the sixties and updated over the years but seem to have a decidedly “Civil Rights Era” feel to them. Urban Intellectuals, on the other hand have created what I consider, a culturally modern deck. I was happy to see that the flip side of the cards were set up as easily digestible bullet points. Ironically that may turn out to be my only point of criticism. The cards present accurate data but not much wisdom. A personal pet peeve of mine in an era awash with data but starving for knowledge. Fact without connections or interpretation can become incoherant babble. 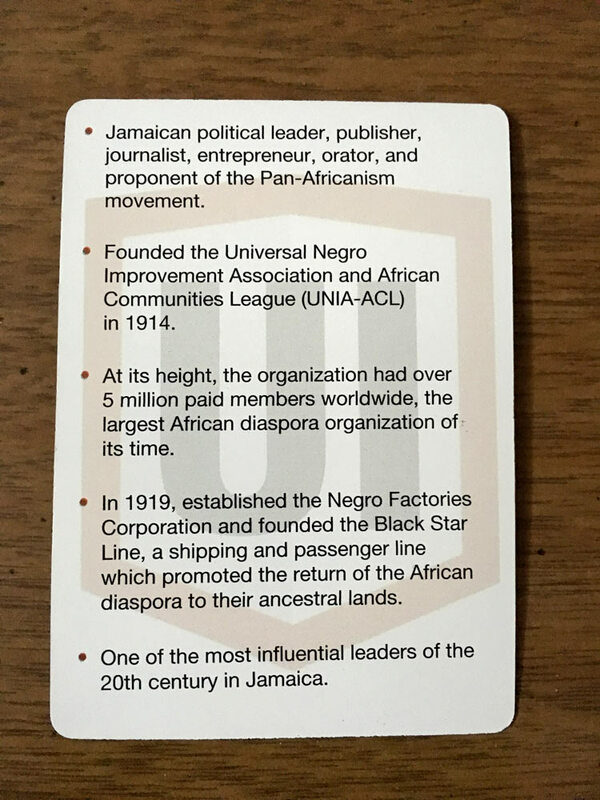 The card above, for instance, is for Marcus Garvey. It doesn’t mention that the Red, Black, and Green flag of UNIA-ACL has been the African American flag and colors for 100 years now. Nor does it mention that Garvey, a Jamaican, was an inspiration for the Rastafarian religion, spawning reggae musicians such as Bob Marley (included in this pack). I don’t know if the bullet point format forces a data driven approach or not but it’s clear that the knowledge and guidance of a parent or teacher is necessary when using this pack, or any form of educational material really. One other point to mention is who the cards excluded: Martin Luther King, Jr., Harriet Tubman, Jack Johnson, and Frederick Douglass. There are sooo many notable people and events in our history, but it seems odd to exclude these giants. Slated for a subsequent volume? Lets hope so. 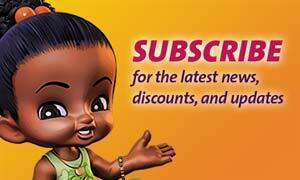 All in all an excellent product that I recommend wholeheartedly. I look forward to the volumes to come. 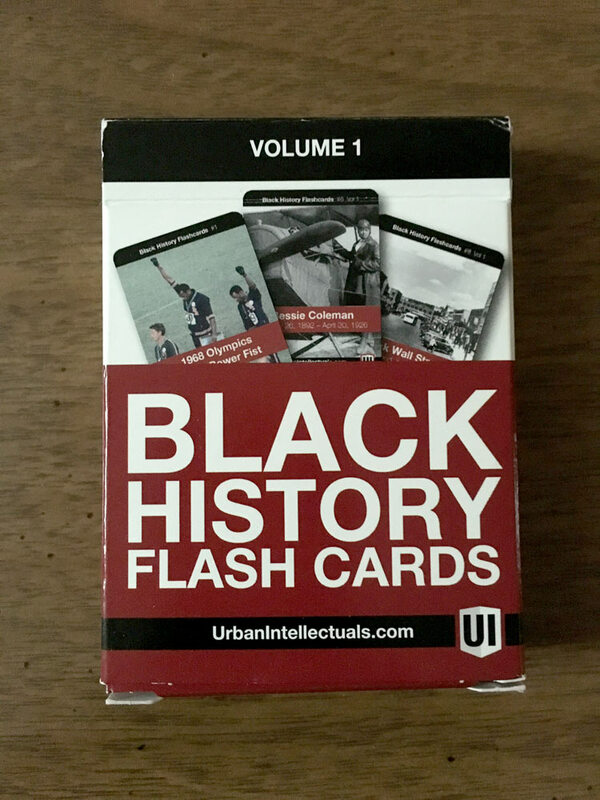 Find out more about Black History Flash Cards.